Making a full-scale motion picture like Prince Caspian is a journey unto itself -- not only a physical one that took hundreds of filmmakers thousands of miles across two hemispheres, but also a spiritual and emotional voyage for the film's family members. With mothers and fathers, sisters and brothers, sons and daughters, and husbands and wives away from home for close to a full year, the film company's 600-plus members bonded closely, sharing in both work and play, to create not only a friendly on-set environment over the lengthy seven-month shoot, but hopefully something greater than the sum of its parts -- something all can hail proudly when the lights go down, the projector flickers, the film unspools, and their collective movie magic enchants audiences the world over. As production began over a year ago on that mid-February morning in Auckland, there stood Andrew, the lanky director, alongside his Pevensie clan like a proud father with his children, home for the holidays. Even though it had been barely two years since the completion of The Lion, the Witch and the Wardrobe, his film family had, indeed, matured, both physically and emotionally. Their patriarch grinned with pride at the progress. 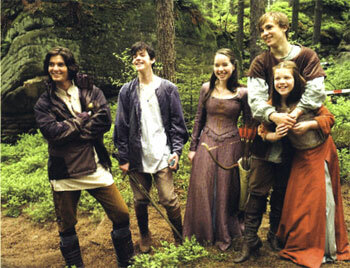 There they were, anticipating their forthcoming experience and joyously reliving the last one -- Peter, Susan, Edmund, and Lucy, in the guises of actors William Moseley (now a dashing 20-year-old), Anna Popplewell (a newly minted Oxford freshman), Skandar Keynes (with vocal octaves much deeper at age 15), and Georgie Henley (approaching teenhood, a good six inches taller than we last saw her). "They've all grown up really well," Andrew beams about his young English cast. "It was nice to see them go back to a really normal life. They were excited about doing this again, and treated it like another adventure. There's change in very positive ways about growing up, but I'd like to say the movie hadn't changed who they are, which I'm really happy about. A lot of that's attributed to their parents. They've all got great parents." "We're a really tight unit . . . a formidable four, you could say," quips Will, the eldest of the quartet. Adds Anna, "The dynamic among the four of us has pretty much remained constant, which is great. I know we'll all still be friends after the movie finishes." "Do I feel like the leader of the group?" the handsome, fair-haired Moseley wonders when asked about the professional and personal dynamics of the four Pevensie actors. He responds proudly and without hesitation: "I definitely do!" "Like I said before, I'm the oldest in my family," he continues, "Anna is the oldest in hers, so she is also kind of the leader. Skandar is the youngest, but wants to be the elder as well. Georgie is the youngest as well. We form a very tight unit. The parallels to our characters are simple -- we're all playing ourselves, drawing on our own lives, to show how similar we are to these characters." While reflecting back to the beginning of the lengthy shoot, Anna was not surprised at the changes the cast experienced since they last worked together, over two years ago. Except, maybe about herself. "What's nice is everyone has grown up a little bit and changed a little bit," she observes. "But, I've probably grown up the least, I'd say. Maybe that's just because I haven't noticed the change in myself." To which Andrew smiles and replies, "Anna's right. When I first met her, she was 13 going on 40. Now she's 18 going on 40." Perry Moore's wonderfully evocative book took us behind the scenes of The Lion, the Witch, and the Wardrobe, where we first met these four relative unknowns, memorably though Perry's vivid and poetic portraits in each actor's chapter. Let's take a further peek at the lives of the four Pevensies, now older and (one hopes) wiser, as they venture from their own private worlds in England back to a magical landscape that has changed drastically since the first movie -- much like the actors themselves! Copyright � 2008 Disney Enterprises, Inc.
Ernie Malik was the unit publicist for both Narnia films and has worked in motion picture marketing for over two decades. Visit www.narnia.com for more information.